Sun Dried Tomato and Basil Hummus | Naturally. I love to entertain, even if it is one of Mike’s friends staying over for a couple of days. If my house could be full of people everyday (well, almost everyday) I would be the happiest person alive. Every time we have people over, I begin to whip things up left and right in the kitchen and sometimes I go slightly overboard. I still don’t believe that one can have too much food around the house. I think my favorite memories are me cooking while everyone else is gathered in the kitchen around me talking and laughing! So, when Mike went to pick Joel (his friend) up, I went to work fixing food. 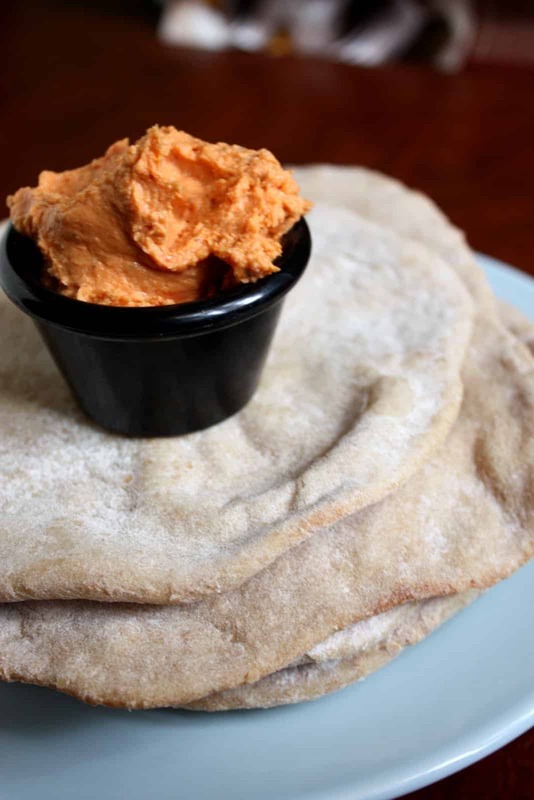 Last summer when Joel stayed with us, he had just stumbled upon the fact that he loved pita and hummus. So one night when I felt energetic, I baked some pita. Well this time I decided to go one step further and make him hummus (and pita.) Well, I tried to be nice to Mike (he doesn’t like garbanzo beans) and make the hummus out of white beans. I don’t know if it was because I was in a hurry or just not paying attention, but the hummus turned into a soup-like consistency. I almost gave up. But hummus is so easy to make! I grabbed the garbanzo beans (Mike could deal) and went to work on my favorite flavor of hummus: sun dried tomato basil. This batch turned out great and definitely put a smile on Joel’s face. The best part? Healthy Snack! Combine all the ingredients expect reserved liquid from sun dried tomatoes in food processor. Turn processor on and continue to run, adding enough of the reserved liquid to bring hummus to desired consistency. I was pretty excited about it! I didn’t have any fresh basil though and I think that would put this over the edge! I am so excited about this recipe; as my tastes have evolved so too has my love for the chickpea. But monotony prevails after going the standard route for such a long time. Tomato and basil is a fantastic combination in ANY food and I can’t wait to try it in this recipe! Thanks! How much basil did you use? I don’t see listed. Sounds fabulous, can’t wait to try!! I use about 1/2 cup of fresh basil but it depends on how strong you like your basil taste- you can always use less or more! Do you mean 2 cups of chick peas? 2 cans seems like a lot. I used one can (about 2 cups) and it was delish! Thanks for the awesome recipe. I had a s-d tomato hummus recipe from a cookbook I lost when travelling and this one did very well!